To each question, the Christian philosopher made a direct reply. At the close of this interrogation, Rusticus passed sentence on Justin and his companions, obtaining for Justin his appellation: Martyr. The proceedings of Justin’s trial, just prior to A.D. 168, reveal some things about the location of early Christian worship and teaching. Justin’s defense before Rusticus also suggests that although the Christians in Rome were becoming fairly numerous, they did not abandon meeting in homes, even if that meant the Christian community could no longer assemble in one place. Thus, the house-church pattern, first articulated in the New Testament, continued for the first generations of the church’s expansion in the Roman world. The Acts of the Apostles portrays the first Christian community in Jerusalem as gathering in the temple colonnades and “breaking bread in their homes.” As the Christian message gained a wider hearing in eastern Mediterranean cities, early believers commonly met in the homes of the community’s more prominent members: Gaius, Titius Justus, and Stephanas at Corinth, Phoebe at Cenchcrea, Priscilla (Prisca) and Aquila at Ephesus, Nympha at Laodicea. Though houses came in various styles and sizes, an atrium in a Roman villa (or a spacious dining room of a Greek house) would accommodate the needs of the small Christian communities. The account of Eutychus’ late-night plunge from his window seat suggests that, in Troas, the Christians met in the third-story dining room of a Greek house. Local circumstances sometimes dictated other arrangements. While in Ephesus, Paul preached daily in the Roman prefect the lecture hall of Tyrannus for two years, and apocryphal stories hint that a warehouse for grain functioned in the same way when Paul went to Rome. 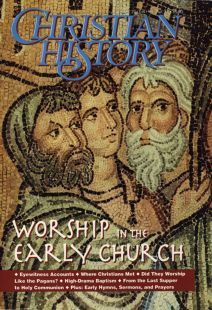 Nonetheless, house churches seem to be the principal setting for Christian worship, at least through the time of Justin Martyr. Less than a century after Justin, important developments had altered the setting for Christian meetings. The most striking example of these changes can be seen at the edge of the Roman world, in the garrison town of Dura-Europos, on the banks of the Euphrates. Dura-Europos was a bustling frontier town, a crossroads between two great imperial powers, Rome and the revived Persian empire of the Sassanians. Possession of Dura had changed hands several times through the second and third centuries. In the early 250s, the Sassanians captured Dura, but the inhabitants of the city soon rebelled against their Persian overlords. The Sassanians returned and besieged the city in 256. During the siege, the cosmopolitan inhabitants of Dura undoubtedly sought divine assistance in the temples of their various gods. Prayers went up in sanctuaries of Syrian baals, desert sun gods, and Persian savior deities, as well as in the temples of more familiar gods from the Greek pantheon—all to no avail. Dura-Europos was sacked, the inhabitants carried off, and the city left to the enveloping sands of the surrounding desert. Shortly before the fall of Dura-Europos, the inhabitants desperately attempted to thwart the Persian siege by heaping mounds of dirt against the western wall. In so doing, the houses nestled against this wall were buried and thus preserved for the archaeologists who uncovered them in the 1920s and 1930s. Three of these private residences had been renovated for use as religious buildings. One had been transformed into a Mithraeum for the devotees of the mystery god Mithras. Another residence had undergone drastic structural modifications, including the destruction of many interior walls, to become a synagogue serving Dura’s Jewish population. Down the street, another private house had been altered to become a Christian church. This church at Dura-Europos is undoubtedly the most significant structure in the history of Christian architecture prior to Constantine. It is the earliest complete church building extant and contains some of the earliest Christian frescoes outside of the Roman catacombs. The private residence was modified by removing one interior wall in the dining area, creating a larger room for Christian services. A small dais at the eastern end of the hall probably served as the worship center. Benches were installed around the walls of an interior courtyard, perhaps to mark off a place of instruction. In yet another room, a canopied baptismal font was erected, flanked by frescoes of Adam and Eve, and the Good Shepherd—perhaps signifying the Fall and Redemption. Baptism was probably performed by sprinkling or pouring, since this exquisite baptistery was too small to allow immersion. The church at Dura-Europos occupies a midpoint in the evolution from early house churches to the monumental buildings of the age of Constantine. Though it began as a private house, after renovation all domestic use ceased, and the building became property of the church. Inscriptions on the interior—Remind Christ of the humble Siseos and Remind Christ of Proclus in your midst—probably hearken back to the donors of the house. It is possible to observe the same process occurring in the rest of the Roman world, in regions as diverse as Croatia, Tunisia, and Britain. The so-called tituli churches in the city of Rome commonly bear the name (or title) of the owners who gave their houses to the church. Several of these, such as the titulus Equitii, the titulus Byzantis, and the titulus Clementis, show many of the same signs of architectural adaptation as at Dura. These tituli churches eventually became the earliest parish churches of Rome. Why were these various private house churches transformed into formal church structures? First, the church was steadily growing. Private dining rooms could no longer accommodate the burgeoning Christian communities, and Christians of higher social and economic status were eager to donate property to God’s use. Second, developments in the liturgy called for new surroundings. Especially important was the gradual separation of the agape meal from the Eucharist. By the mid-second century this separation was complete, and thus the private dining room was transformed into the community assembly hall. Still, the process was relatively slow. The early church’s belief in the imminent return of Christ discouraged church construction, as did the threat of persecution. Throughout this period, however, property was continually added to the church—including plots of land outside city walls, land that could be used as Christian cemeteries. The most famous were the subterranean cemeteries outside Rome known as the catacombs. Despite Hollywood images to the contrary, there is not a shred of evidence that Roman Christians ever hid in the catacombs. During the first several centuries of the church’s existence, however, Christians did worship in suburban cemeteries. Sometimes commemorative feasts were held at graves because of the widespread desire to worship “in the company of the martyrs.” Some thought of the cemetery as the place where the dead slept until Christ’s return (cemetery is from the Greek koimeteria, or “sleeping places”). Others believed that martyrs, though sharing triumphantly in Christ’s kingdom, were also sacramentally present in their remains. When Emperor Valerian ceased his persecution of Christians, in 260, his son Gallienus ordered all church property, including church buildings, to be returned to Christians. This restoration ushered in the last major phase, prior to Constantine, in the evolution of church buildings. Unlike the house churches, which looked outwardly like private dwellings, the churches erected during this period were large structures. They were designed to accommodate the throngs of new believers who swelled the church’s ranks. In some cases, Christian communities acquired property adjacent to the renovated house churches, tore down or modified their properties, and built spacious new prayer halls. Despite some hyperbole, Eusebius makes clear that Christianity was becoming increasingly visible in the Roman Empire. Not everyone was pleased with these developments. Church buildings attracted the ire of Diocletian and his colleagues during the last and greatest persecution of early Christianity (303–311). It was left to the patronage of Constantine (312–337) to rebuild these churches in an even more splendid manner. Dr. Christopher Haas is assistant professor of history at Villanova University in Villanova, Pennsylvania, and author of Late Roman Alexandria (Johns Hopkins).